Donuts! Now this would get most peoples attention but it usually wouldn’t get mine. I’ve never been a fan of them and if they are in the house they wouldn’t tempt me I would let them sit there. However I will say that recently I have found a couple I like but that doesn’t mean I crave or would run out and get them. If you follow me on Instagram you may have seen that my family and I have this thing we are doing this year called Donut Dates. Every month we pick a new local donut shop to go to and go as a family to check it out, discuss life, and well eat donuts. My husband and the girls like their donuts! I use to whip up protein mini donuts for the girls but I lost the mini donut pans in the remodeling shuffle last fall/winter. 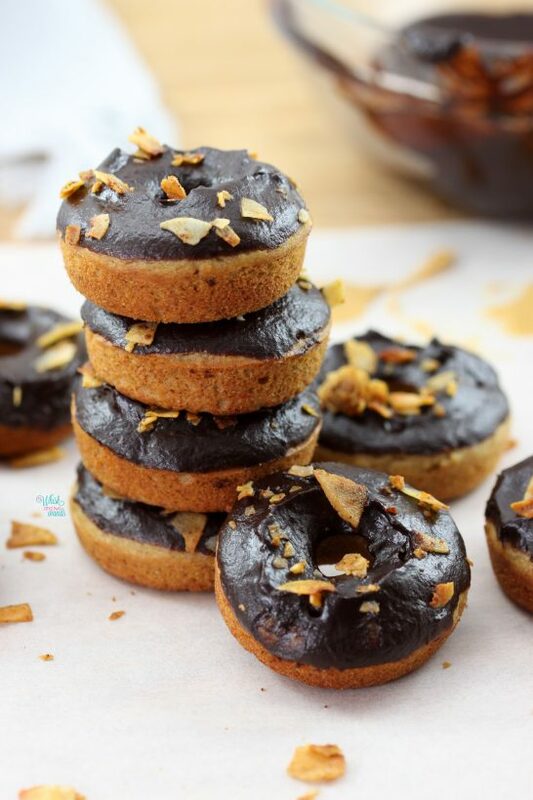 I recently found them which means I had to whip up some protein donuts! Now which flavor…. Well if you follow the blog you know I also love the “Elvis” combo, peanut butter, banana, honey, bacon. Since my oldest has been getting a donut with chocolate icing and bacon on top 3 out of the 4 Donut Dates this year I thought it was fitting. 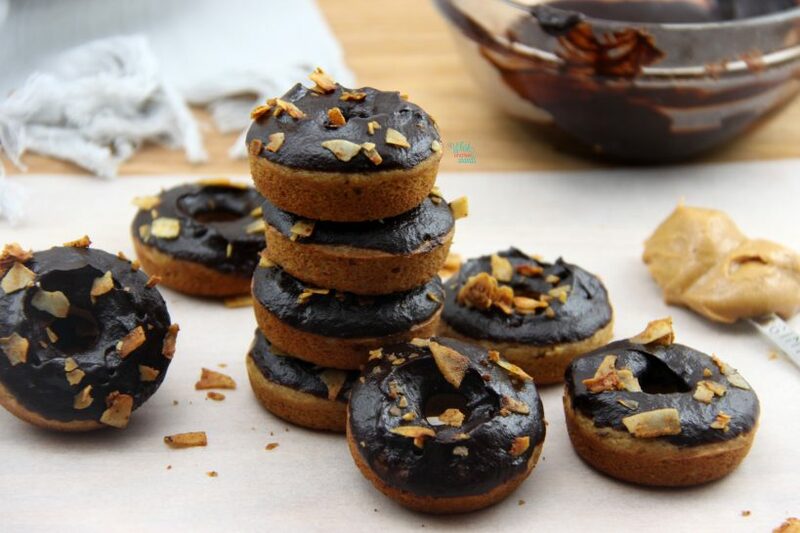 So I whipped up some delicious peanut butter banana mini protein donuts, sweetened with maple syrup (honey for non vegan but my family said ones made with it were much sweeter in our test batches), topped with chocolate icing and sprinkled with coconut bacon! The coconut bacon give it the right amount of salt and savory to balance out the sweet! However you could easily make these without and use sprinkles or any toppings you want. Since they are also gluten free and vegan they will also be at the top of the list of options for making the mornings after the girls have sleepovers as they are allergen friendly (of course not peanut free). Preheat the oven to 350F. In a bowl combine coconut oil, peanut butter, maple syrup, and vanilla extract until smooth. Add in banana puree and set aside. In a large bowl mix together salt, baking powder, gluten free flour, protein powder, and powdered peanut butter. 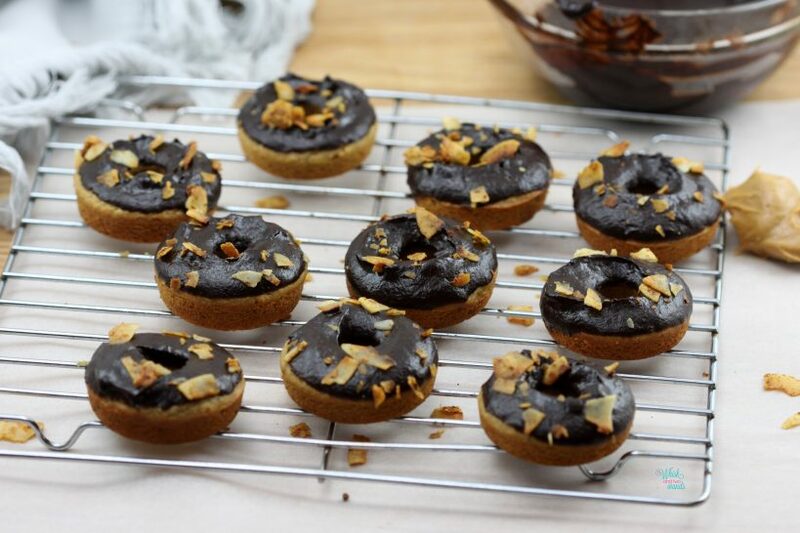 Prep mini donut pans spraying with coconut oil or non stick spray. Slowly add the wet ingredients into the dry, folding in until just combine being careful not to over mix or your donuts won’t be as light and fluffy. Spoon or pipe into pans. I like to use a frosting bag to quickly pipe it in. Bake for approximately 12-14 minutes. Remove and let sit 5 minutes before removing and let cool on a cooling rack. In a small bowl mix together coconut oil, maple syrup, and cacao powder. 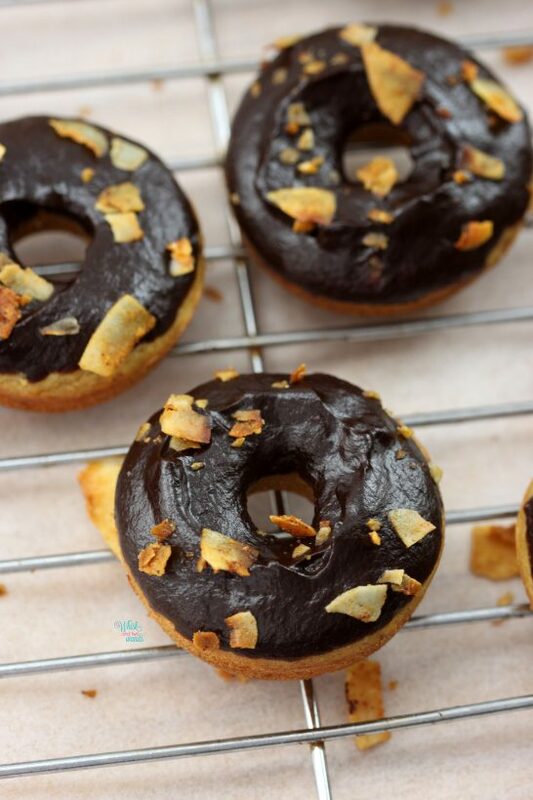 Dip donuts into chocolate frosting and sprinkle with coconut bacon. 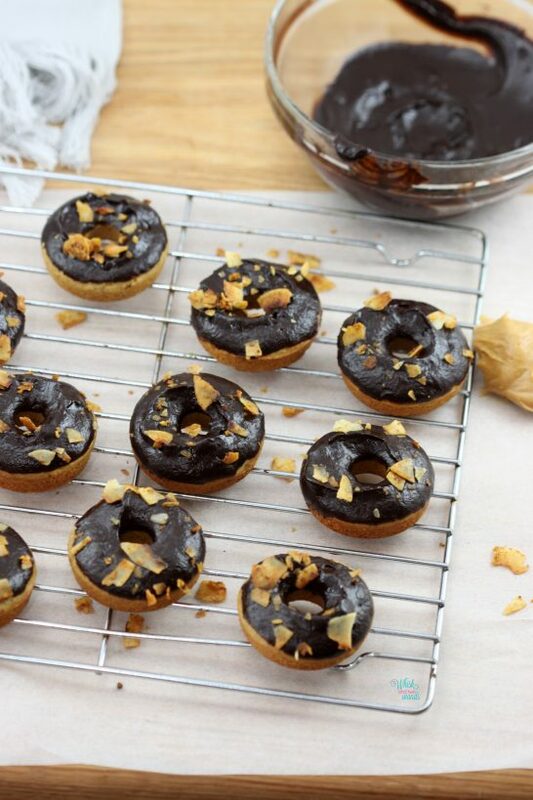 As with any mini donuts these are best enjoyed the day they are made. Enjoy! Ah the doughnut creativity! I love it! I finally made a new batch this week…I hadn’t made any in months! Thank you! Before a couple weeks ago when we were making these we hadn’t made them since last year since we misplaced the pan. What kind did you make? 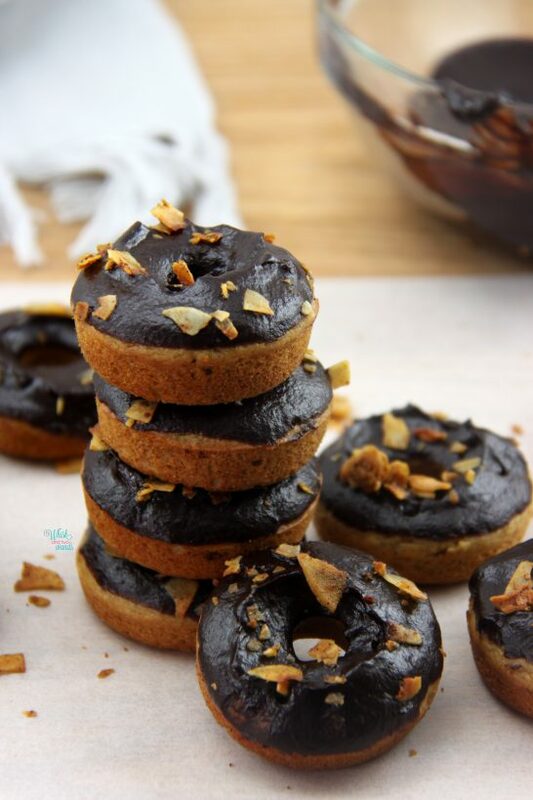 I saw these on FB and literally started drooling…they look SO GOOD! Annmarie recently posted…Celebrate National Egg Month with this Eggland’s Best Recipe! Now I could get down with these. I was just thinking how much I love sweet and salty together. Do you have a favorite salty sweet combo you are loving lately? I’m loving how much peanut butter you have in these! They look so yummy and so cute! Thank you Farrah! Not hard to do since they are mini donuts! Haha! Thank you Emilie! It must be a grandparent thing. That is when I always had them and my mom is the one who got my girls hooked on donuts! Making at home the options are endless and you can make them healthy, which is great. I like our mini donut pan but was debating on getting a regular size but these seem to work well for the girls. Thank you Alexa! They make things fun! We have the mini, oh and a JUMBO (more like a bundt cake pan) and I was debating a regular size. If you do get one the options are endless! These are adorable!! 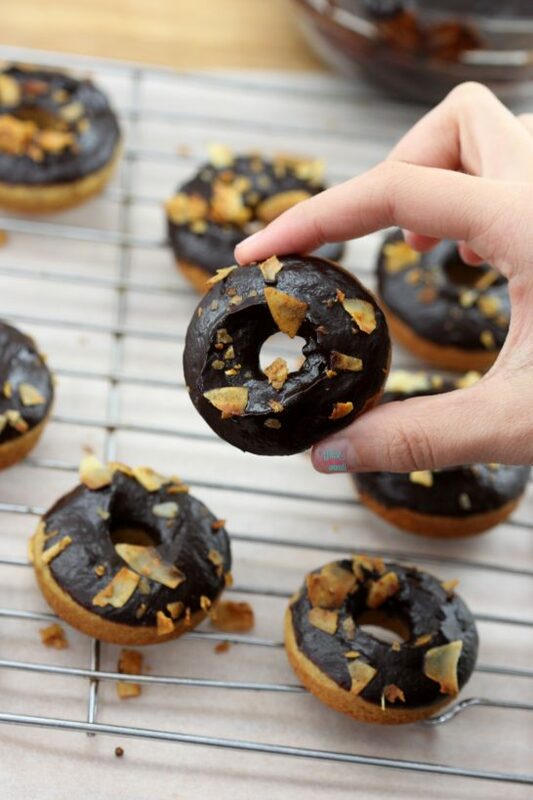 I made donuts this weekend – they’re so much fun! Going to have to try these. I love vega protein!